The Hepatitis B virus is not a virus to be trifled with and the WHO estimates that there are now 240,000,000 patients chronically infected with Hepatitis B virus worldwide, of which 25% will eventually die from chronic liver disease or liver cancer. A highly effective vaccine for Hepatitis B virus is available (my advice is: take it and immunize yourself) and because the virus only infects humans, it was believed that hepatitis B could be globally eradicated. That view is relegated to the realms of history now because Hepatitis B virus has now been discovered in bats. Samples from 3,080 bats from Panama, Brazil, Gabon, Ghana, Germany, Papua New Guinea and Australia were screened and ten positive specimens were found in tent-making bat (Uroderma bilobatum) from Panama (TBHBV), and roundleaf bat (Hipposideros cf. 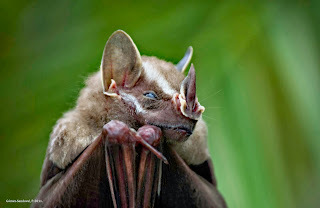 rubber) and horseshoe bat (Rhinolophus alcyone) from Gabon (RBHBV and HBHBV). Analysis revealed that the bat viruses form three different lineages. Earlier this year anotherHepatitis B Virus was identified in long-fingered bats (Miniopterus fuliginosus) in Myanmar (LBHBV). The question is whether these series of bat Hepatitis B viruses can infect human cells and whether the Hepatitis B vaccine will protect against these new types of the virus. The study showed that only Hepatitis B virus from the tent-making bat could infect human cells and serum from humans that had been immunized with for hepatitis B vaccine did not protect against the virus from bats. This signifies that bats are carriers of all sorts of potentially lethal virusses. Not only are they the potential source of MERS, they harbour new subtypes of Influenza A viruses and now it has been revealed that they also carry unknown types of Hepatitis B viruses. What's next?